A new research study was just published on the Pew Research Forum website. You can find it here. 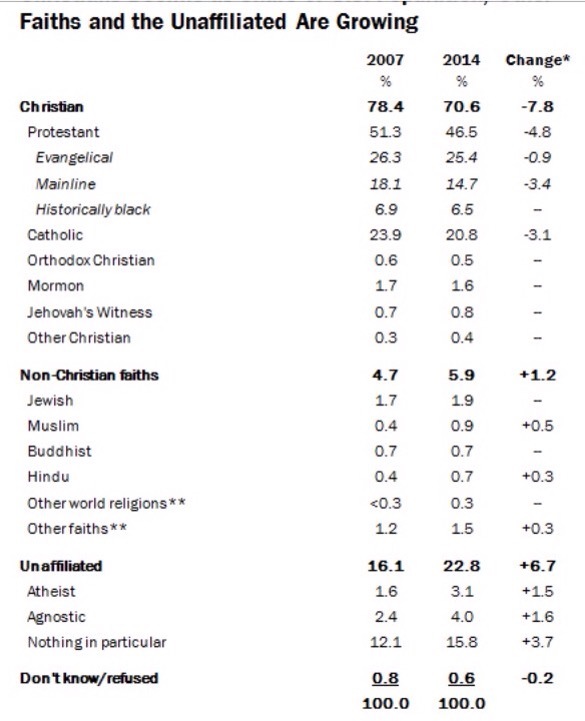 To sum it up, the religious score in America is in: Hindus, Muslims, Atheists and Agnostics are up. Christians are down. This surely shouldn’t be a surprise to anyone who watches the news, reads the paper, has set foot on a school campus, or even watches popular TV. And for anyone in Christian ministry, it is abundantly clear. More and more people are less and less rooted in the culture, ethic and story of the Bible. Rather than bemoan these results as many Christians will, or use these stats to marginalize a biblical faith as many are doing, I believe these results can strengthen our mission as Christians. 1) First, it reminds us the self-professing is not enough. This survey, like all surveys are answered by people who “self-report.” They tell whether or not they are Christians. This is really an unrealiable measurement. I’ve had many people who have told me they had a particular church home. But when I asked how often they attend, or if they are involved, they give me a sheepish grin. They realize they’ve been caught. Real affiliation isn’t a label, but a commitment. There are many who would call themselves Christian, though Jesus wouldn’t call them Christian. Jesus warned of that himself. Self-reporting isn’t enough. We need to inspect the fruit of our lives. That brings us to the next point. 2) Second, it makes us redefine what being a Christian is. This survey may shake us at first glance. But it should cause us to be a little introspective. After all, “what is a Christian?” Our affiliation may or may not be an expression of our faith. I read an article this last week from a lady, who is an atheist and she wants to hang onto the traditions of her Episcopal upbringing without confessing Christ. Huh! I guess, at least she’s honest. But she’s not Christian. What is a Christian? Lest we think this was just “Paul’s opinion.” Confession is important to Jesus too. In Matthew 10:32-33 Jesus said, “So everyone who acknowledges me beforemen, I will also acknowledge before my Father who is in heaven, but whoever denies me before men, I also will deny before my Father who is in heaven.” This is why people would rather take a sword to the throat then deny Christ. Ok, so now we know what a Christian is, even if imperfectly. That should motivate all of us self-professing Christians to reevaluate where our loyalty lies. There is another good thing about this survey of fewer Christians. 3) Third, it confronts us that we live in a big mission field. We don’t have to go to another country to share about Christ, though we should. We just have to go the Jewel, McDonalds, the YMCA and yes, even church. People who are lost are no longer “out there” somewhere. They are here. They are with us. And in some instances, they may be us. 4) Fourth, it gives us an opportunity to be different and make a difference. Remember Jesus said, “You are the salt of the earth… You are the light of the world… (Matthew 5:13-14).” We can’t count on culture to make the difference we should personally be making. We are commanded by Christ to be transformed by His Spirit. When that transformation takes place, the world will notice. Some won’t like it. Some will be indifferent to it. But some will be attracted to a life of purpose, love, joy and hope. And we will have a clear answer when asked, “Why?” It is the work of Christ, by the grace of God. The truth is, I don’t want fewer Christians. I want everyone to be restored to God through Christ, just as God does. I also don’t want to lose my heritage of living in a land where it is easy to be a Christan. But more than being comfortable, I want the real, powerful gospel of Christ to bring life to those who are lost. And the first step to that usually begins when people know they are on the other side of grace. That’s how it happened to me. Thanks for reading Lynn. It is a time when we as believers need to get our heads around our mission in this changing time. Praying for you and Don as you prayerfully seek God’s leadership and strength.